Many of those nominees are non-controversial. The Treasury Secretary won’t be. The economy is the central political issue right now, 2012 is an election year, and Republicans have sufficient votes in the Senate to mount a filibuster. Under those circumstances, it’s very difficult to imagine them permitting the confirmation of any Treasury Secretary. Treasury Secretary isn’t a controversial appointment. Think about this from the perspective of Republican senators: it’s not a lifetime appointment; Obama is almost certain to nominate a sober, moderately liberal, establishment-approved kind of personality; and in any case, the truth is that the Treasury Secretary has only modest power that’s independent of Congress’s authority. 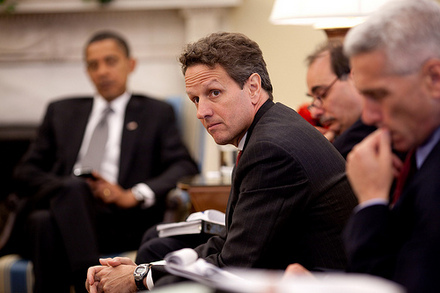 Geithner’s successor would be very unlikely to seriously affect deficit negotiations, spending priorities, budget battles, or Obama’s reelection chances. Our nomination process is indeed broken, but it’s broken only for the less visible class of appointments. This is important: Republicans have routinely held up circuit court judges, ambassadors to medium sized countries, agency heads, deputy and assistant cabinet positions, and so on. But they haven’t held up Supreme Court appointments, cabinet secretaries, or other highly visible appointments such as Fed chairman, head of the CIA, or chairman of the Joint Chiefs. These kinds of nominations get too much attention, and that’s exactly what Republicans don’t want. They want their obstructionism to fly below the radar. Holding up a Treasury Secretary for anything other than a slam dunk reason would make their obstructionism far too public and would risk engaging the normally jaded DC press corps, which treats the obstruction of lesser appointments as just garden variety partisan politics. I know this seems counterintuitive, but just take a look at the record: all of Obama’s major appointments — the kind that get front page treatment — have been approved without all that much fuss. Republicans just don’t want to practice their usual brand of obstructionism when the spotlight is shining. It’s only the lesser lights that get filibustered for months on end.